The Washington Post reports that the United States played a major role in training young democracy activists who were involved in the recent uprisings in Egypt and Tunisia. The revolutionary roar from the Arab street, shaking the palaces of the privileged, toppling presidents, has echoed around the globe, dominating the headlines and airwaves for weeks. But behind this story of political upheaval lies another, quieter story of outside organizations that, with U.S. government and other money, tutored a young Arab generation in the ways of winning in a political world. All involved emphasize that what has happened sprang from deeply rooted grievances in the autocratic Arab world, not from outside inspiration. But they say the confidence-building work of democratic coaches, led by the U.S. but also including Europeans, was one catalyst for success. That success, meanwhile, points up a core paradox: A U.S. government that long stood by Mubarak and other Arab leaders as steadfast allies was, at the same time, financing programs that ultimately contributed to his and potentially others' downfall. It's estimated more than 10,000 Egyptians since 2005 have participated in USAID-financed democracy and governance programs, carried out by NDI, IRI and 28 other international and Egyptian organizations - not only political training, but also projects to prepare judges, build PTA-style school associations and otherwise deepen civic involvement. The American democracy promotion campaign dates back to the 1980s, when Poland's Solidarity movement was one beneficiary. But for Egypt, 2005 was the watershed year, when Campbell's NDI opened a Cairo office and through Egyptian groups trained 5,500 election observers to monitor a referendum giving Mubarak another six-year term, his fifth. From Egypt's polling places that September, NDI-paid teams reported election violations via innovative cell-phone texting in code, deciphered by headquarters computers. "It had the effect of showing the emperor had no clothes," Campbell said. "Egyptians could make a difference. They could change things." The government reacted, restricting NDI and IRI operations in Cairo, ordering host hotels to cancel training sessions, putting security men in institute offices. But Mubarak couldn't be too tough on the Americans, donors of $1.5 billion in annual military and economic aid. And the democracy promoters carried on, often sending Egyptian proteges abroad for sessions. It's a pity they didn't teach them to accept Israel and stop promoting anti-Semitism. 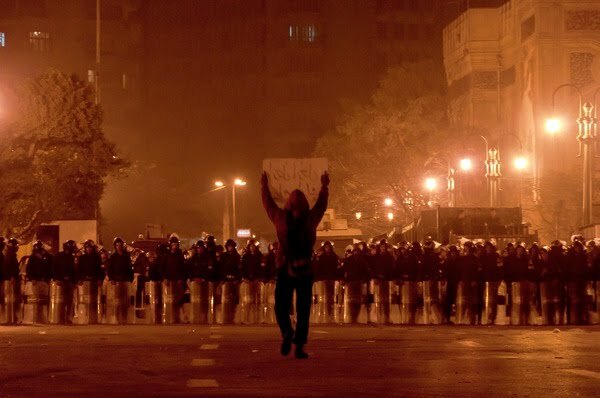 I have a feeling that the ones who will be ruling Egypt won't be the people trained by the west. Success? These same people they funded to rebel are now being imprisoned tortured and killed by the governments they fought! They received no armaments from the Commies in the USA, EU and wherever else. Is this just a pathetic,useless and more to the point DANGEROUS extension of Osama/obama's "community organising"?? BTW, reading the pathetic drivel about Obama being bullied at school, is that supposed to be an excuse for him and his government's behavior, especially towards Israel? They are all unspeakably disgusting! PS, why did they not do this for the Iranians? ?